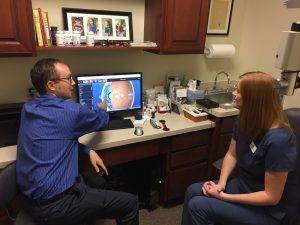 Dr. Belill & our team have provided the full spectrum of eye care services from routine eye exams and prescriptions to co-managing and treating various ocular diseases, such as macular degeneration, dry eye, diabetic retinopathy, glaucoma, and cataracts. We enjoy helping clients of all ages, whether your child is ready for their first eye exam to older patients seeking a complete examination of their eye health to detect the earliest signs of eye disease. Our vision plays a pivotal role in our lives every day, and through the various eye care services at our practice, we’ve helped prevent vision loss and ensured long and clear eyesight for our patients. Dr. Belill also treats a diverse clientele through specialized contact lens fittings to help patients with keratoconus achieve comfortable and clear vision. Plus, we’re one of the few practices who manage myopia progression to keep our children’s eyesight remain healthy and clear throughout their school years until adulthood. Orthokeratology, or "ortho-k," is the process of reshaping the eye with specially-designed rigid gas permeable contact lenses such as CRT. The goal of ortho-k is to flatten the front surface of the eye and thereby correct mild to moderate amounts of nearsightedness and astigmatism. Myopia, also commonly referred to as being “nearsighted” is a condition where light from objects in the distance focus in the front of the eye, instead of where it’s supposed to focus on―the retina. This causes distance vision to distort and become blurry. Myopia starts in childhood and progressively deteriorates into young adulthood. Fortunately, the effects can be slowed or stopped through myopia control. We offer same-day or walk-in appointments for any eye emergency that you have. Whether it's an eye infection or broken glasses, we are here to help. Your eye health and vision depend on your body's overall health. Conditions like diabetes are known to lead to vision loss when left unmanaged. Annual diabetic eye exams or a consultation will help you track and detect changes in your eye health and ensure a long life of clarity.